The next frontier taking lead in real estate market is none other than Blockchain Technology, transforming it towards advancement and efficient forefront. Along with the numerous improvement in the real estate industry, this unique technology has the power to alleviate longstanding challenges that were more like impossible. Over time, a huge transformation can be seen in the way we transact physical assets in this industry. Either, it is about listing a property or closing deals, multiple stakeholders, data sources, services providers and others, buying and selling involve lots of redundancies, errors, delay, and cost. Here, the use of blockchain technology will help in establishing a transparent transaction which will help buyers and sellers. Blockchain offers huge possibilities in real estate from real-time ledgers to full-on shared databases and processes. These modern technologies are considered booster for Real Estate Website Development. They owe capability to turn the simple web page into the magnet to pull customers. However, it is crucial to understand the technologies and how it can be applied to generate income from the real estate business. Real estate development companies are constantly exploring advanced technology like Blockchain to create the difference and make out the best possible solution that benefits the industry. In this Blog let's explore what are the benefits that the Real Estate industry will undergo leveraging Blockchain Technology in application development for more innovation and advancement. Security has been concern area in the commercial real estate development companies and they are seeking and adopting blockchain technology, security and transparency are expected to increase like never before. The ideal approach towards blockchain adoption is to search blockchain application development company, offering unique and reliable solutions relevant to the respective industry type. As we know, both buying and selling is an expensive affair and involve lots of efforts and time. Therefore, anyone looking for property in any context will look for reliable information. And how if property seeker irrefutably get to determine the history of property using the blockchain technology to verify previous owners and information. Isn't it a great offering of technology. Moreover, combining parcel will become easier to record with blockchain technology. Apart from this, there are many companies already engaged in the transaction on the blockchain Platform. Like in other industry, Blockchain Technology has the potential to transform the real estate industry, and pave a future of innovation. We can consider, this technology as transformative and can reshape the process how data transaction takes place or is exchanged to create value. Impact of Blockchain Technology In 2018 that will change the prospect, Real Estate perform business. The blockchain is the capacity to exchange database and processes. This provides promising opportunities to make real estate data easily accessible and centralized. As we know, every real estate transaction undergoes MLS to track client's contracts, listing agreements, appraisal and etc. MLS is notoriously fragmented, so professional with no property business background doesn't have access to real estate data as the information is decentralized and restricted. This hampers professional time and compromises their comparison ability and spot trend. In this regard, blockchain technology is used to overcome these challenges in the MLS real estate. It opens up the channel to secure shared data on the nationwide database, offering real-time data access to property seekers. Further, it helps to authenticate an opportunity for collaboration between the real industry enthusiastic professionals. Other than MLS, one of the major challenges in the real estate is Title record. The title information was stored and made offline, even in the previous year. However, with blockchain, this will somewhat change. 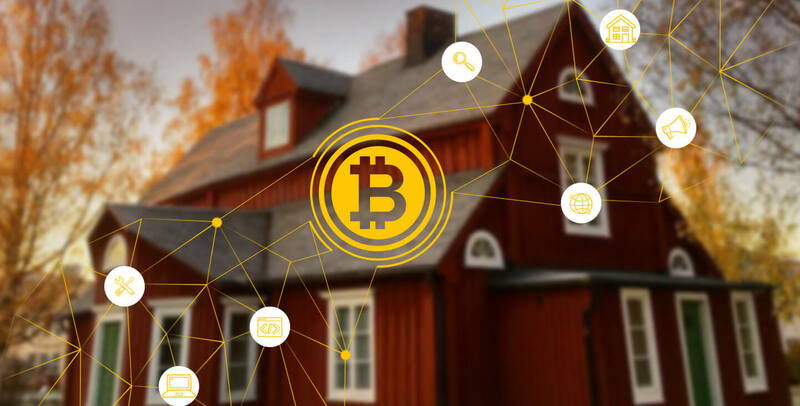 The first real estate technology experiment with blockchain for transferring and tracking property title was carried in 2016. Therefore, with this, whenever someone bought property they received a digital token, hence the record was being saved and was a proof for the ownership. 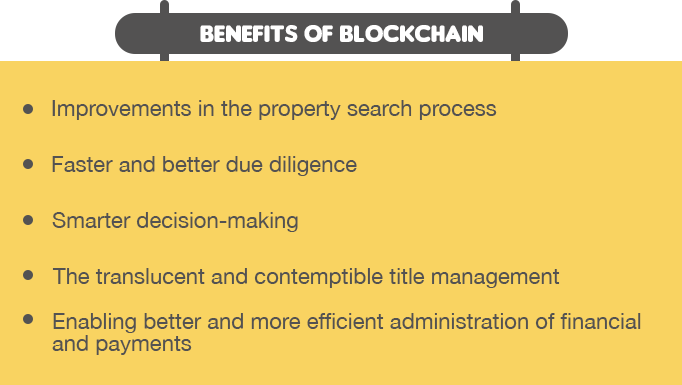 The blockchain offered a central title database to securely store and access title record, allowing a streamlined title transfer in the property. Inmam stated it as one of the most useful experiments in the history of real estate with blockchain. One of the confidential areas in real estate is efficiency and security for the transaction. Let's understand, what happened here, each user is assigned with a unique identity on the blockchain via cryptography, i.e. financial information of the user is shared securely with other parties during transactions. This means until the transaction completed, no information is released regarding fund transfer. Blockchain technology streamlines the real estate ecosystem, making information more accessible, no third party involvement and reduces the fraudulent and theft. This enables to integrate a secure, speedier, trusted process in the application development for buying and selling of property - and this is good for everyone involved. It has established secure and efficient, data and money transaction. For a more secure process and easy process for the application development - Hire real estate web developers from a renowned company. For secured Real Estate Application Development - fill in the form given below with your complete requirement!